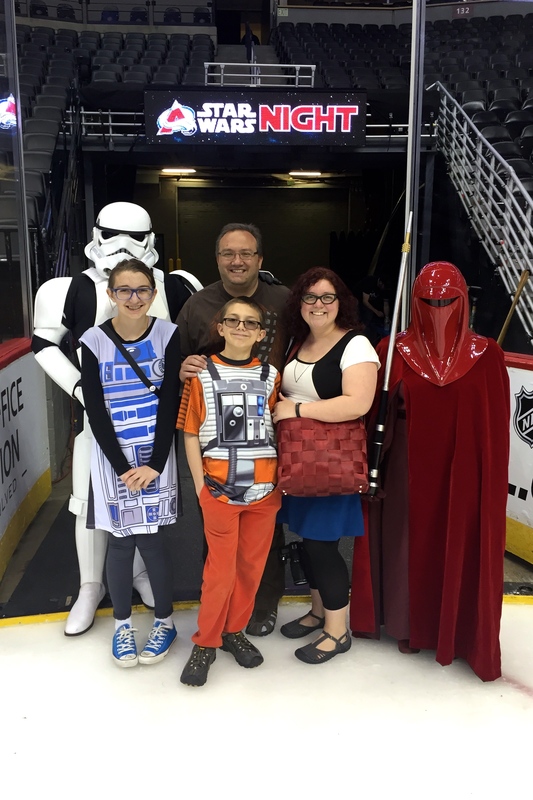 By now you’ve probably noticed that we’re a “little” bit geeky, as families go. Yesterday we geeked out in a major, public way. 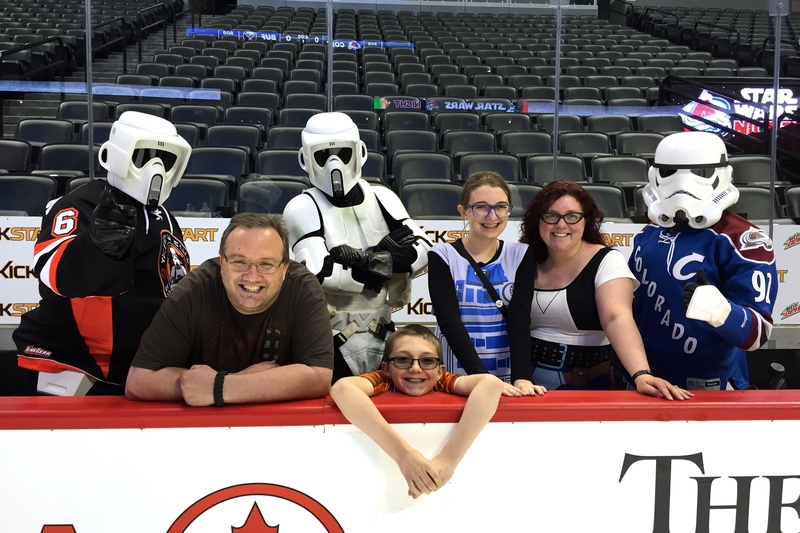 The event was 2 fold: in the afternoon, there was an hour where ticket holders could go on the actual NHL ice, and meet and take photos with members of the 501st Legion, as well as the good guys. 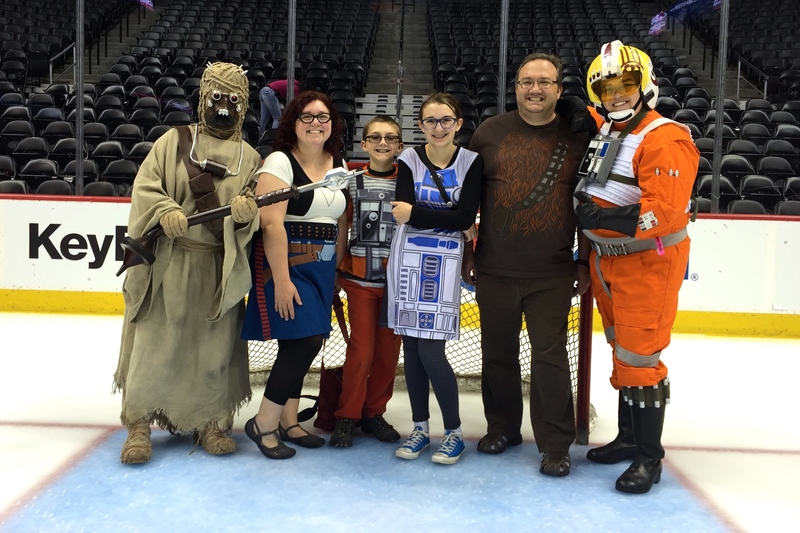 The email said costumes were encouraged- so costumes we wore. I actually do own a Han Solo dress. I know, I know. But when I was a kid, I was going to grow up to marry either Han or Indiana Jones. So, that didn’t work out, but at least on occasions where a costume is required, I can dress up like Han, right? Rich has a Chewbaca T-shirt that he busts out for halloween, etc., and I also have an R2D2 dress that I wore one halloween that Annie borrowed. 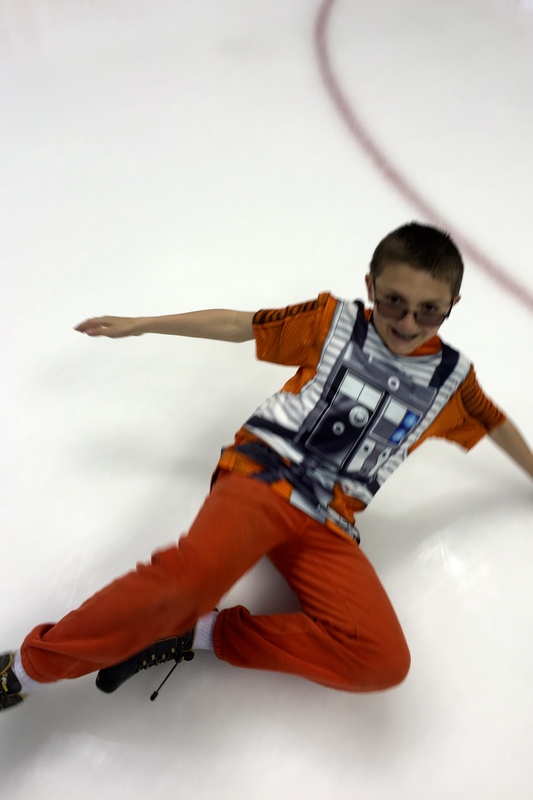 Henry used to have an entire wardrobe of star wars costumes, but he’s outgrown them all, so we picked up a new Xwing fighter pilot shirt for him… Hey, we’re going to Comic Con in May, so we’ll get some more use out pf these outfits. 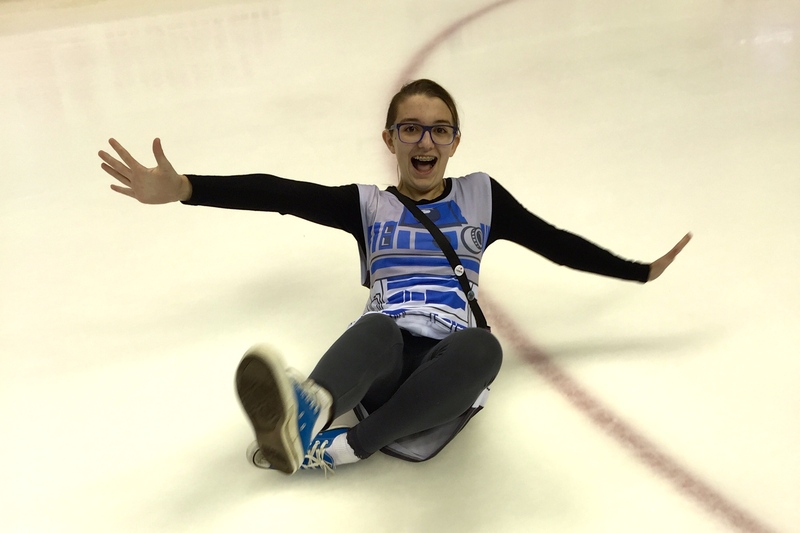 The ice was less slippery than I expected- but the kids still couldn’t resist sliding on it. 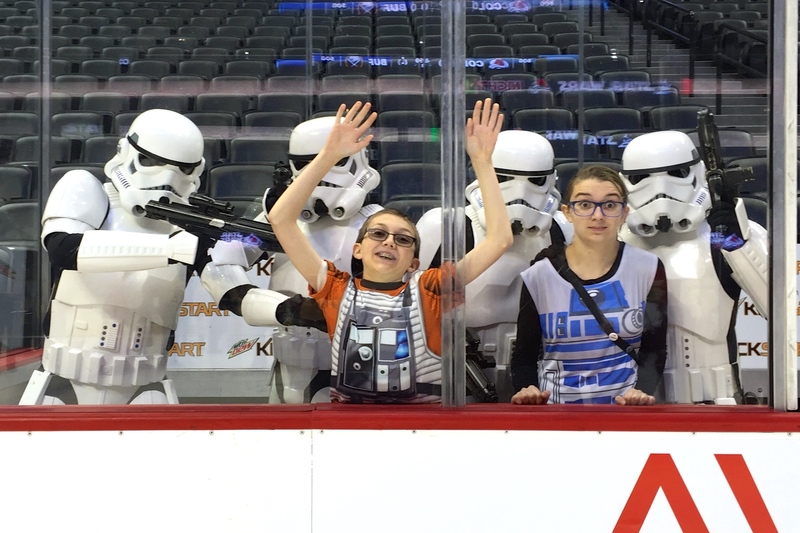 I was bummed that they didn’t seat all the Star Wars ticket holders together- we were scattered al over. 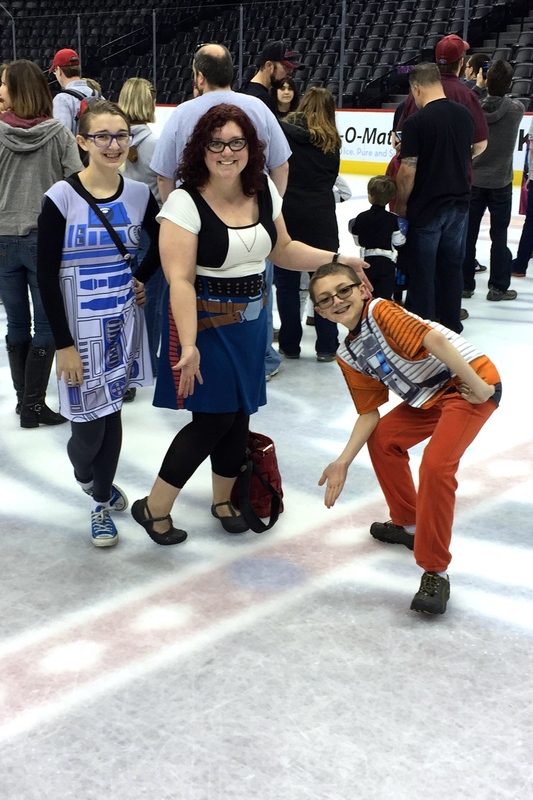 It would have been fun to have geeky bonding time- rather than odd looks from regular fans. But oh well. Aside from that, it was a truly awesome night. A short hop on a long trip. 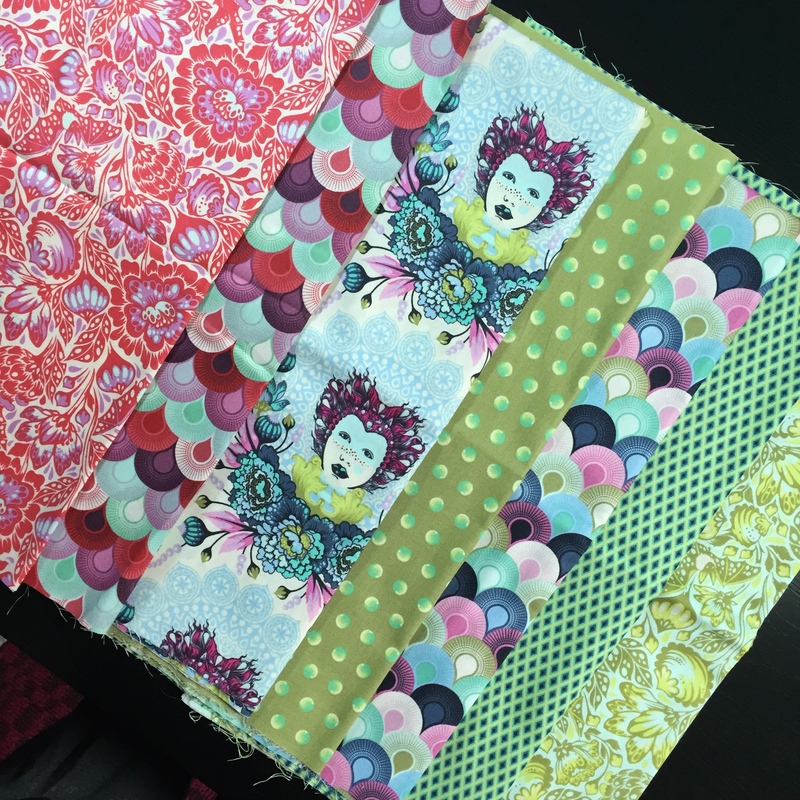 I started a scrappy trip along precisely to have a go-to between other projects- especially a go to that is simple (I’m using Bonnie at Quiltville’s excellent tutorial, the only difference is my strips are 2″ wide, because I had a ton already cut that size). So, I’m between projects right now… and I got it back out last week. I’m up to 36 blocks now. Not bad for a project I barely touch. I’m pretty certain that this barn raising style layout will be my final choice. 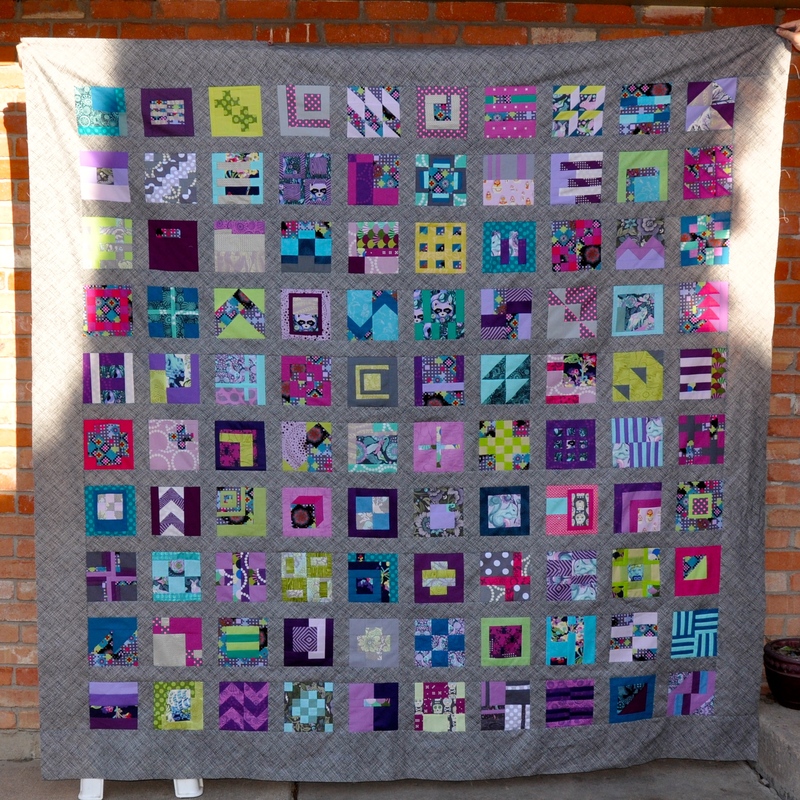 This one is ALSO destined for our bed, so I need it to be 10×10 blocks to get it to size. 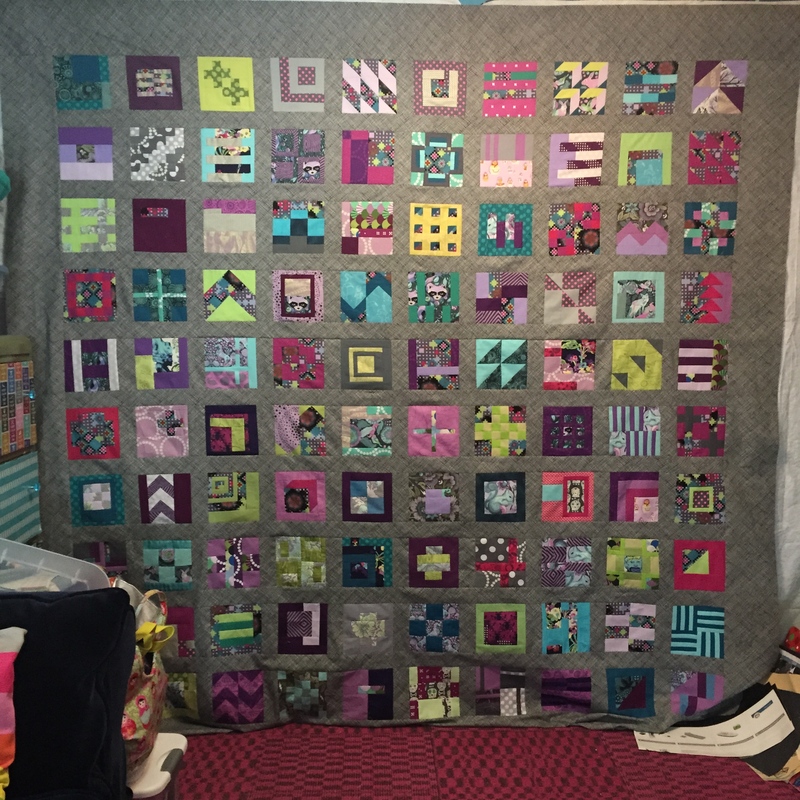 By the end of this year, I’d like to have 3 new quilts for our bed. My goal was always to have 4 to rotate between (seasonally? ), and we were at 3. But then there was the great bleach incident that is too painful to talk about, and we were back to 2. I love them both, but I get bored. One is also a wee bit narrower than I would like- I so wish I’d added ANOTHER extra row when I made it. You can check it out on my old blog. No wonder I’m bored with my bed quilts- looks like they both date back to 2007! When this one is done, I will have a total of 5 to choose from. 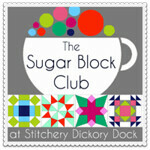 The 2 current options, the modern cross that’s being quilted right now, the city sampler, and then this. Not too shabby! 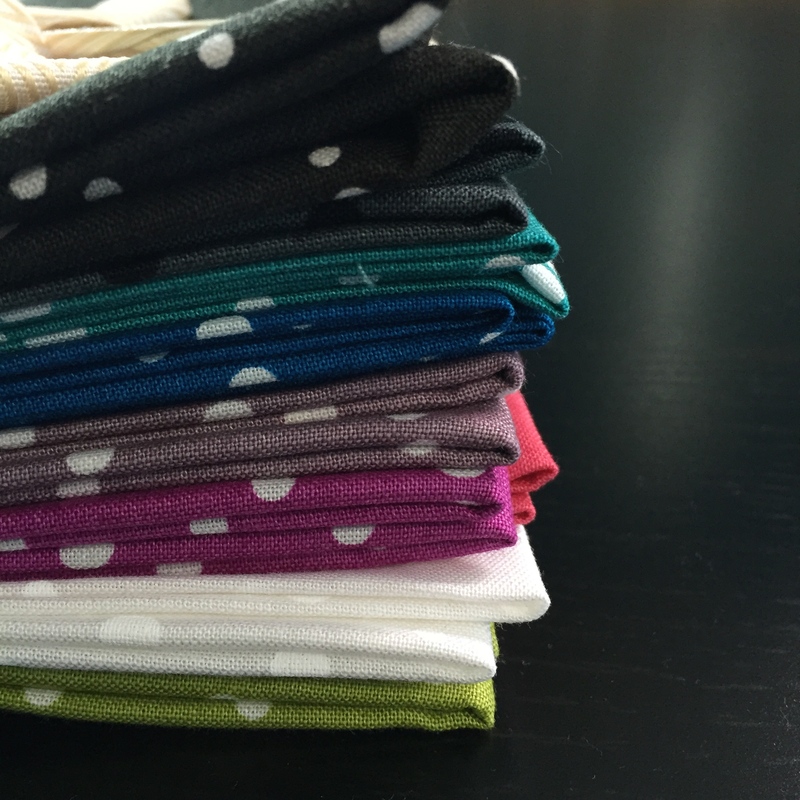 Overall last year I was really good about buying fabric. Not a ton came into the house. Blenders, lots of blenders. And some other tasty treats, of course. But my resolve has been weak as of late. 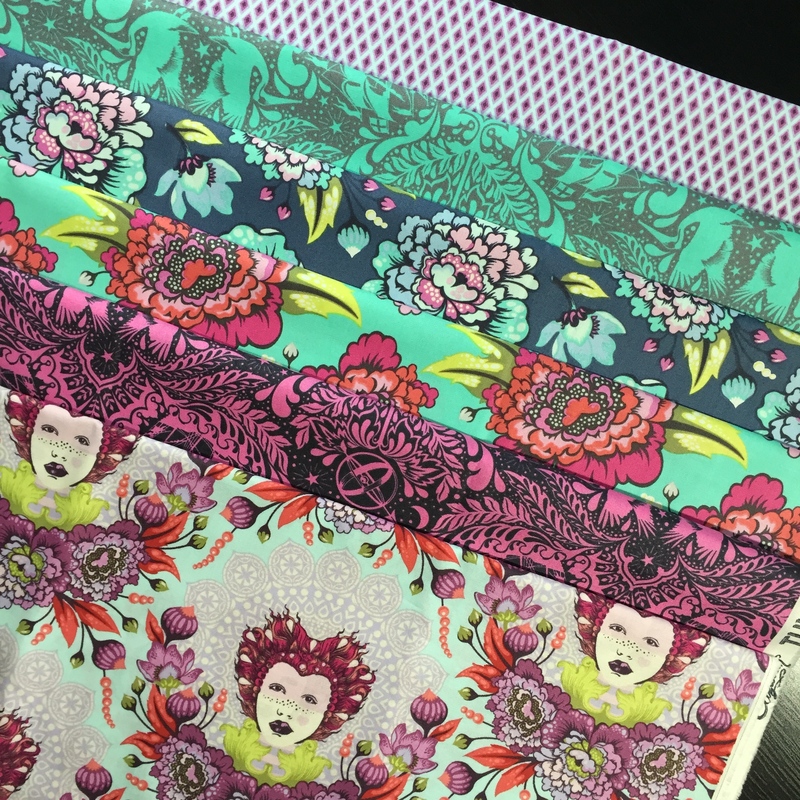 I blame Tula Pink and her awesome new Elizabeth line. Before it was even released, I placed a preorder through QuiltHome. 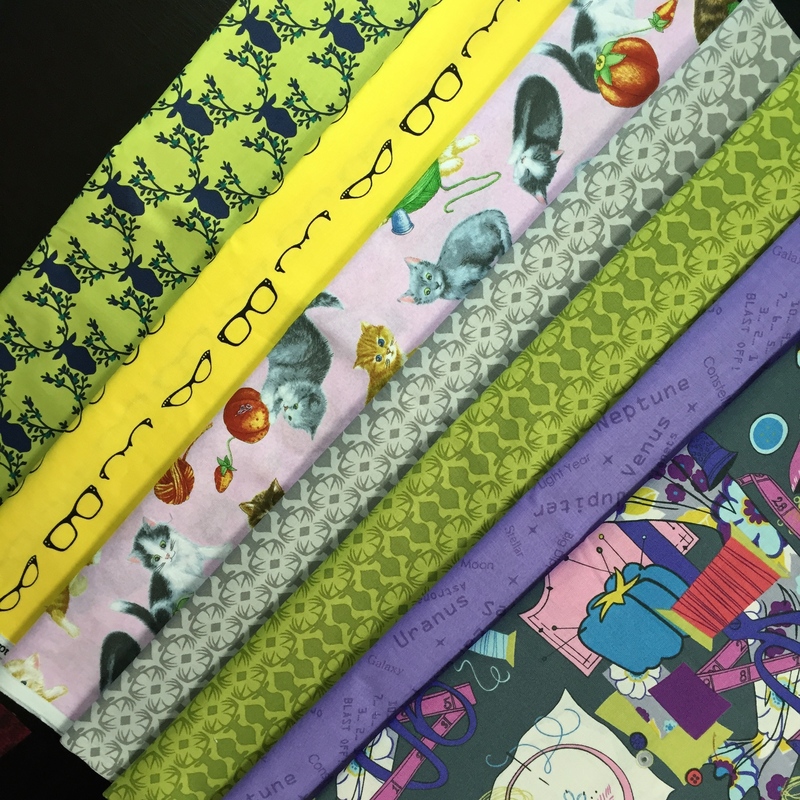 They had a fab discount… and I was certain I bought all the pieces I wanted. It arrived, and I loved it. And I wanted more. Way more. But of course, the discount coupon code was expired by then… What’s a girl to do? Answer: check out the LQS going out of business sale. This particular store was lovely, and carried a great selection of modern fabrics, but their prices were at the higher end of the range, and that kept me from going too often. But when the closing sale got to 40% off everything (last week) I couldn’t resist. 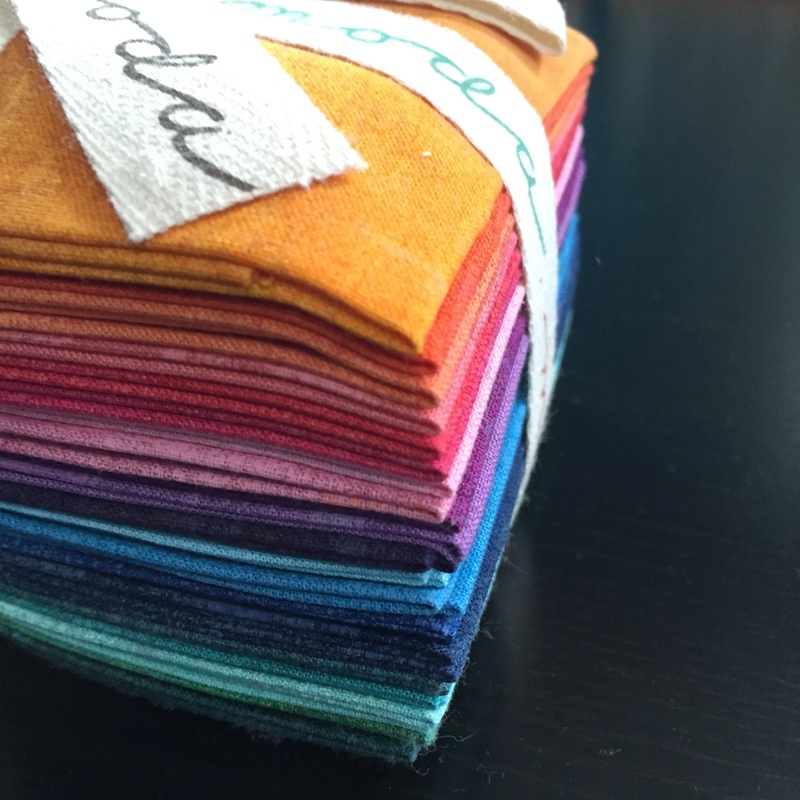 The Aurifil was totally cleared out, and the fabric was close behind, but I managed to find a few treasures. They had quite a few Tulas from Moonshine and Foxfield left. And even an Acacia. And some good blenders. But by now my fabric willpower was shot to hell. So when the Equilter sale email popped up in my inbox, I couldn’t resist it. In my defense, this is only half of what I originally had in my cart. Equilter is in Boulder, just up the highway from us- so I should have had this practically overnight- but they didn’t ship it for a whole week. THEN I got it practically overnight. This is all novelties, something I do don’t need. But the glasses in yellow? I have some in pink but needed, yes needed, more. And the space text purple is for Annie. 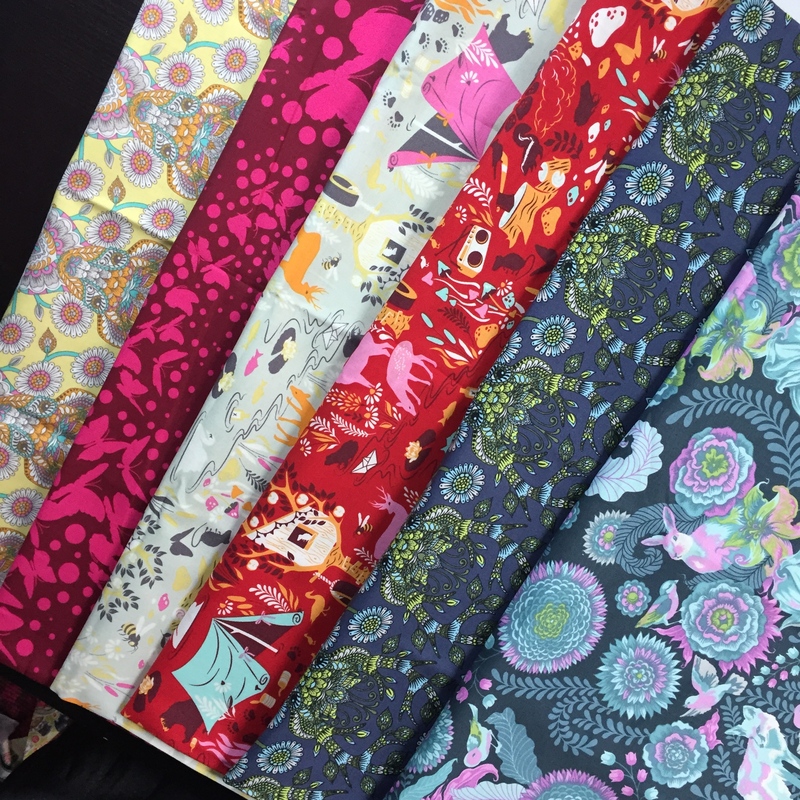 The awesome Alexander Henry sewing theme print is one I’ve been eyeing for ages. 3 deer head prints, yum. And the piece de resistance, the kittens- with yarn! Meanwhile, I went looking for more Elizabeth online. 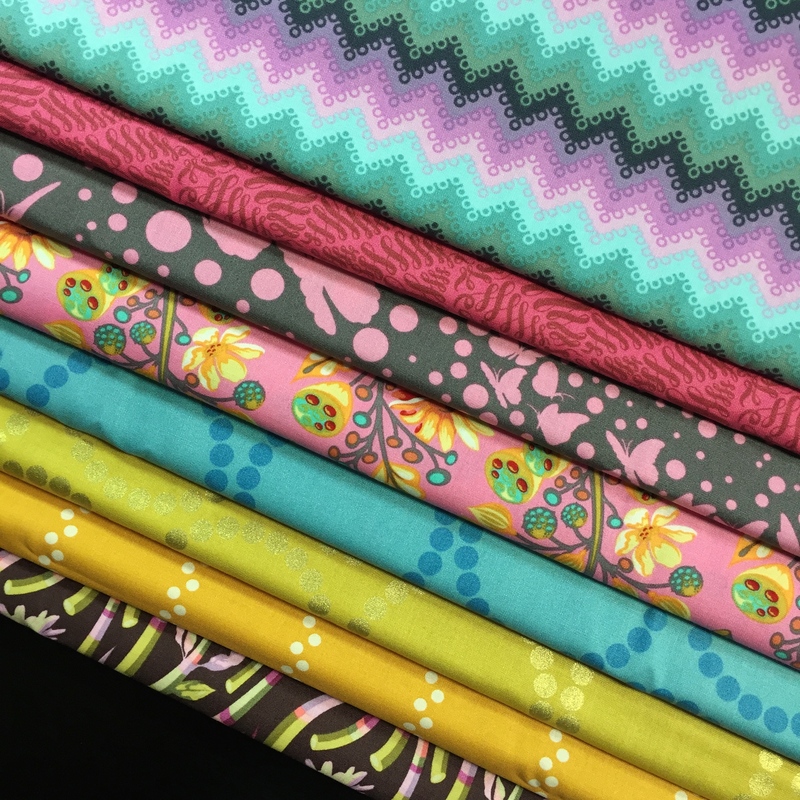 Hawthorne threads had it all, and at a great price, and some other Tula pieces I wanted. 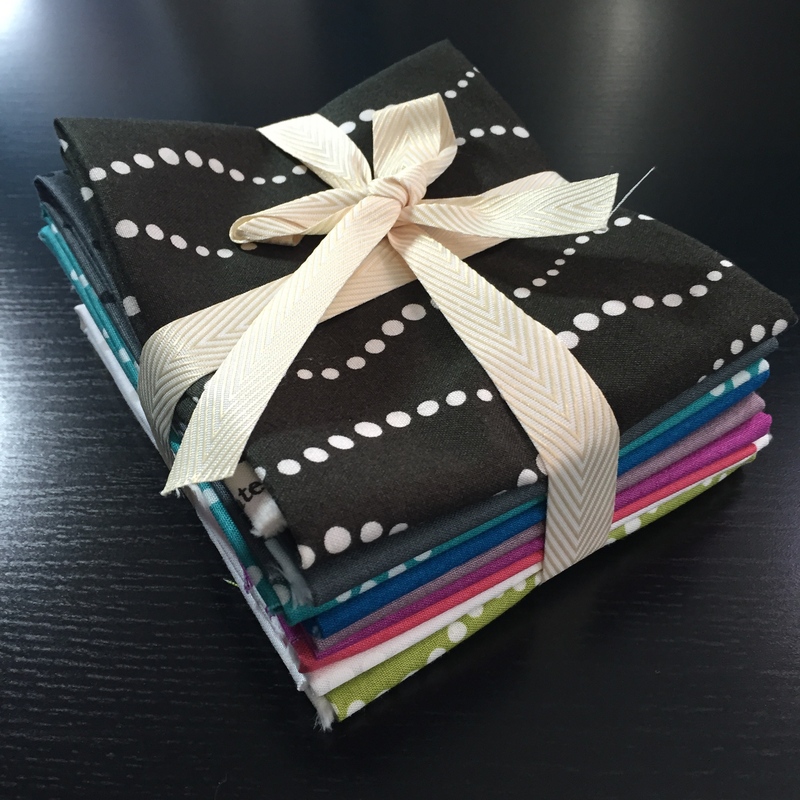 And just in case you thought that wasn’t enough, I bought an Allison Glass FQ bundle from Massdrop. More blenders! My first Massdrop experience was great. I didn’t commit to buy unless the lowest price was unlocked- and it was a good price that included shipping. The shipping was fast, too- I had these FQs in my hands very quickly. If you haven’t checked out Massdrop yet, it might be worth it. If you sign up and eventually make a purchase through my link, I met get a cool swag box. The prices range from great to not really better than you might find elsewhere, so it’s worth shopping around before you commit. Finally, I have a sweet prize that I kept forgetting to photograph. 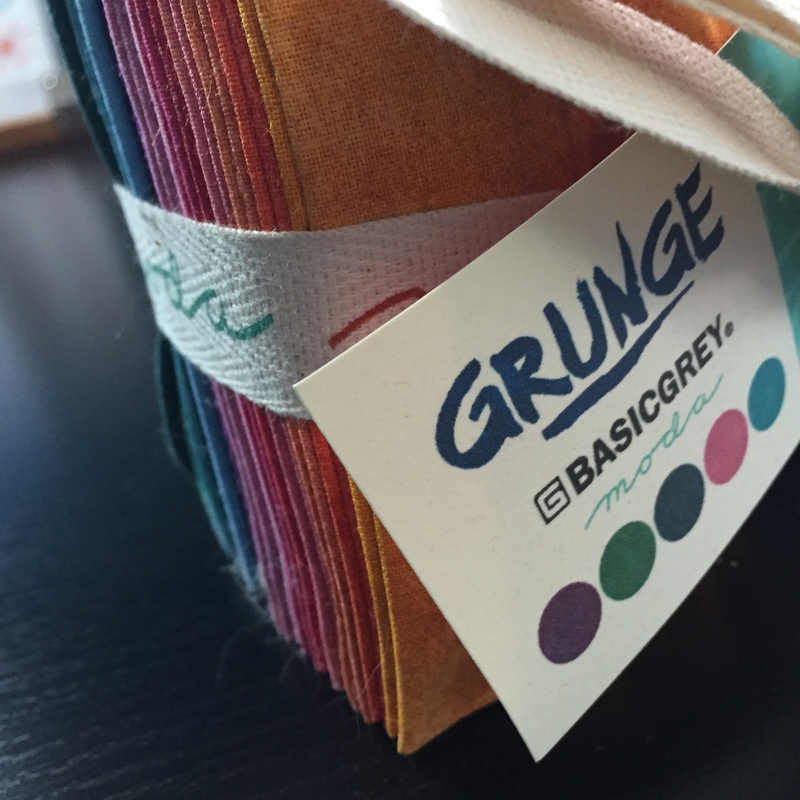 I won it from Blossom Heart Quilts and the Fat Quarter Shop a while back (um, in November last year)- a fat eighth bundle of Moda Grunge Basics. I’ve been off the blog for a while, because after finishing my Tula top, I was beat. Oh, yeah, I finished that sucker! 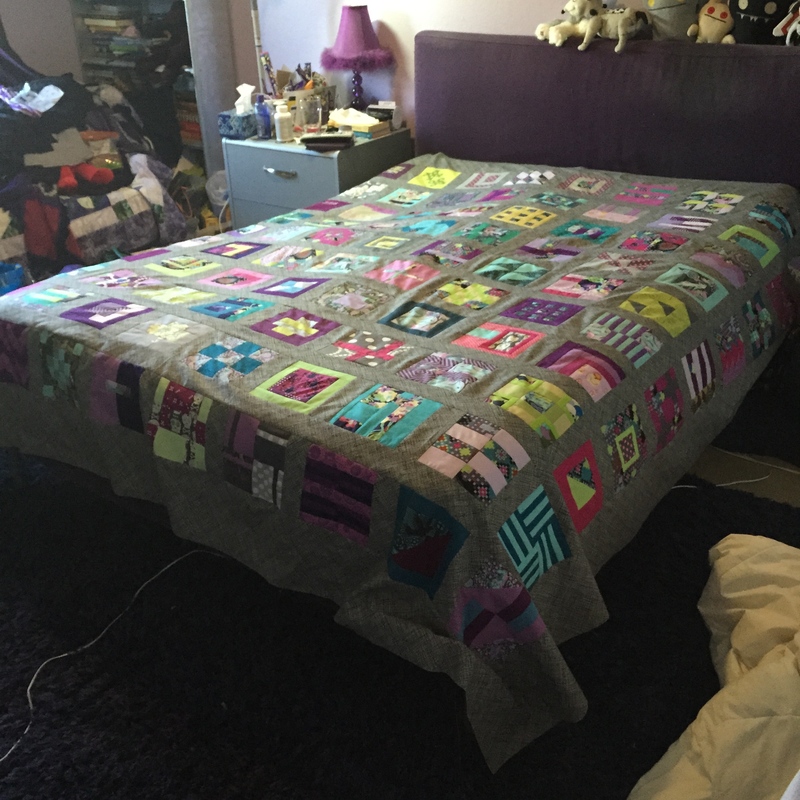 And I’m struggling to take some decent photos to show you- a 90×90 queen sized top is hard to shoot. Meanwhile, I’ve been busy. Finished a shawl, a hat, and some socks. Started a new afghan. Had one of my busiest work weeks of the year. And also threw a little party. You might have heard, at least if you are in the US, that this past Saturday was the Pi Day of the Century. 3/14/15. 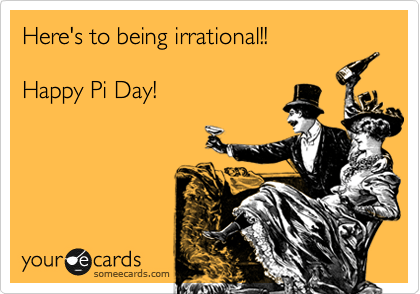 To take it further, the exact moment of 9:26am and 53 seconds on March 14, 2015 is the longest date representation of the mathematical abstract Pi this century. 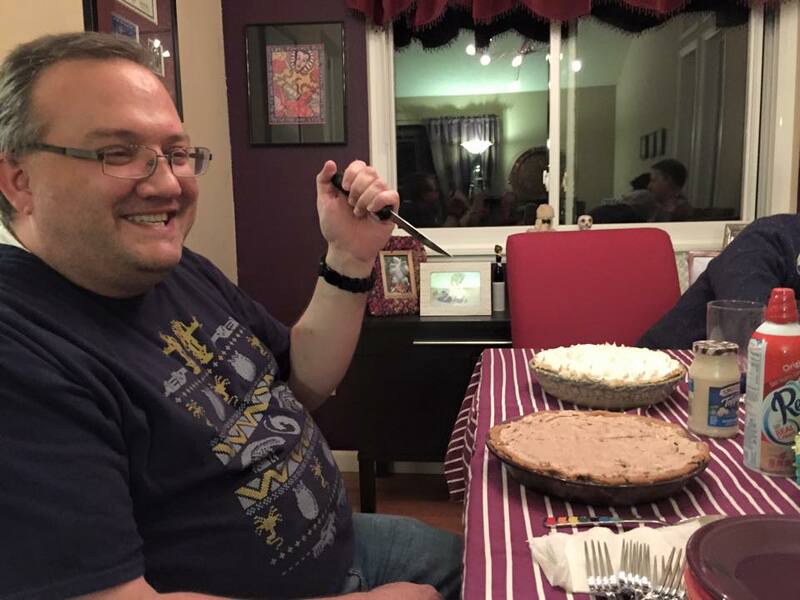 At least, if you record dates the American way… Pi Day is always a fabulous reason to eat pie- but the Pi Day of the Century calls for more than just a pie. 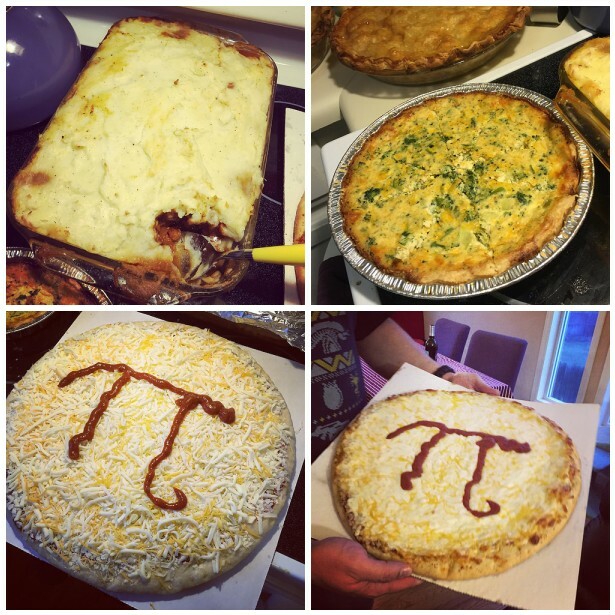 So we invited some equally geeky friends over and we ate all the pies. To start, we had shepherd’s pie, quiche, and PI-zza. Rich made the shepherd’s pie from scratch. I married well. The quiche and pizza came from Costco- and we personalized the pizza with some extra pizza sauce. Of course, we couldn’t stop there. 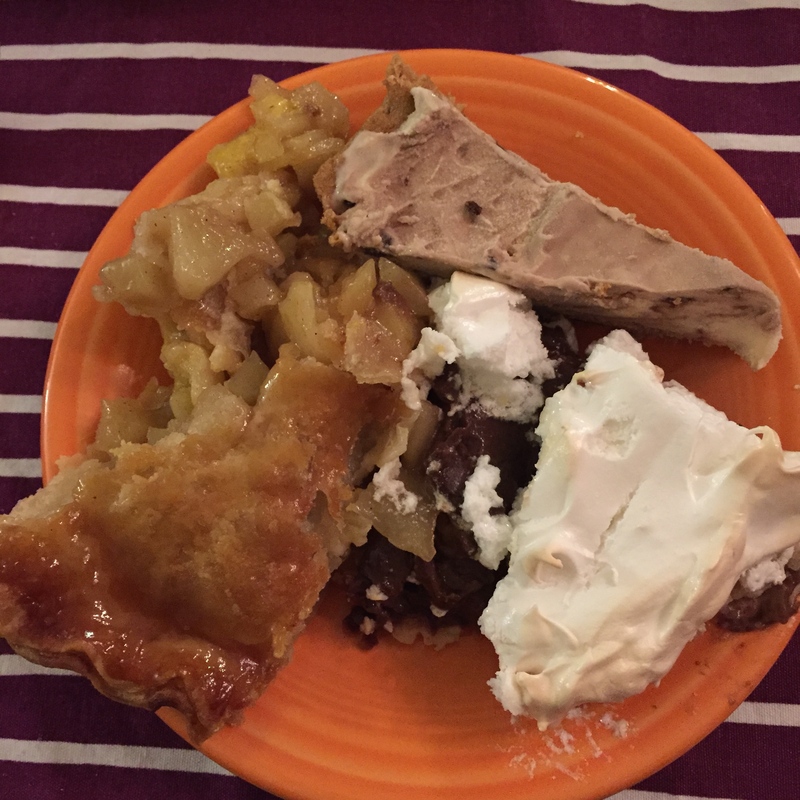 Savory pies are great, but we needed sweet ones as well. 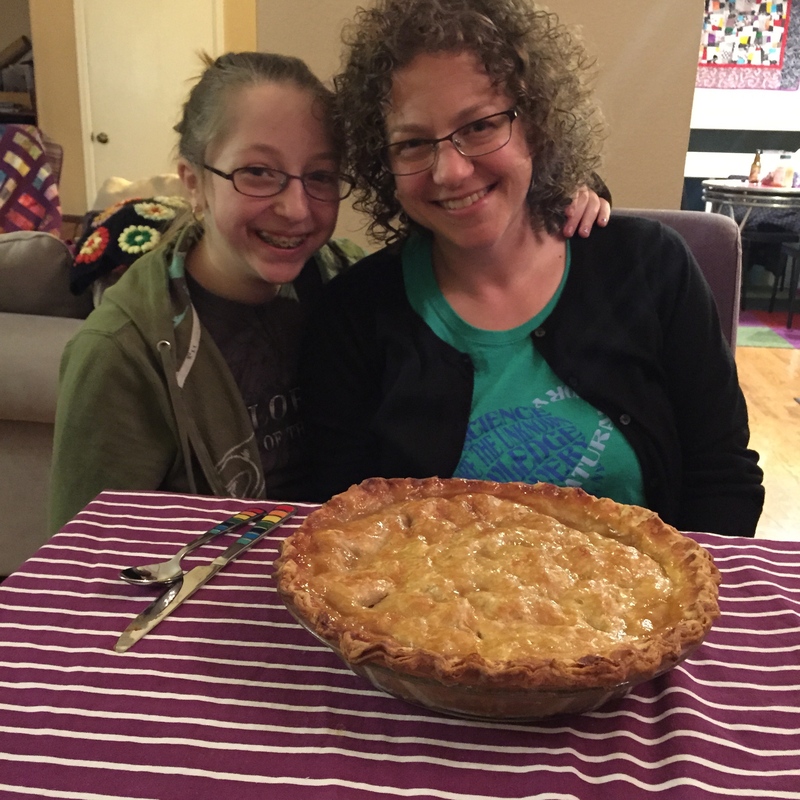 Our guest Becky made not one but 2 of the most amazing apple pies ever- and she had a cute helper. There’s honey on the crust. Oh it was good. And because she made two, we got leftovers!! 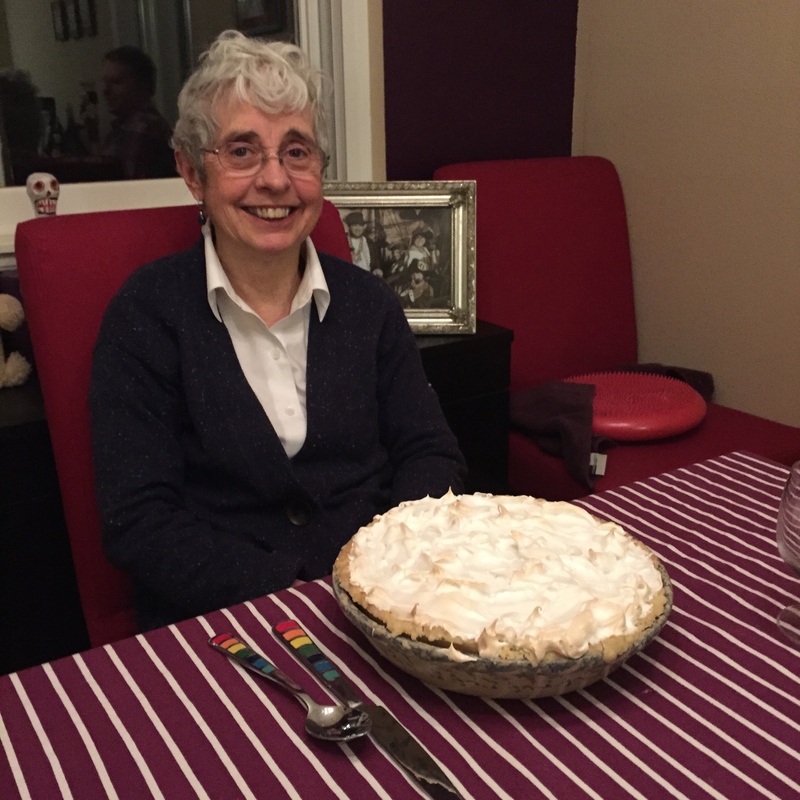 …her amazing chocolate cream pie- a Thanksgiving tradition in our family since I learned about the pie as a grade schooler. 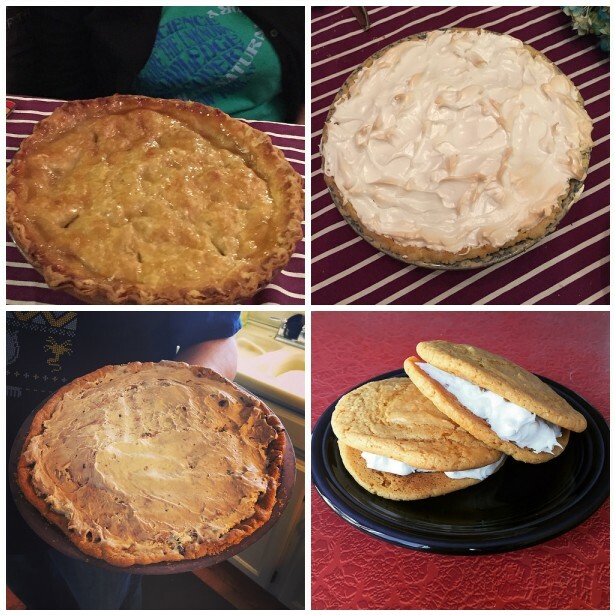 He started with a chocolate chip cookie dough crust, and filled it with ice cream. But that wasn’t all. The ice cream was Lazy Sunday by Ben & Jerry’s– ice cream that contains pieces of cake, and frosting. So, it was a cookie-cake-ice cream-pie. I even baked. This is a very big deal. I am afraid of my kitchen*, and truly hate preparing food. Eating it? Whole ‘nother story. 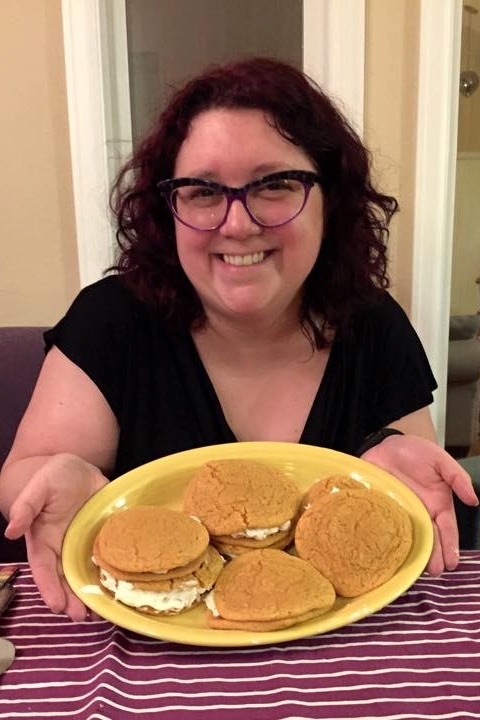 I made butterscotch whoopee pies. I found a recipe online that was easy enough even for me… These were delicious, but very very very sweet. I think eating one all by yourself would give you insta-diabetes. Thank goodness this day only comes around once a century, because we might not survive another one! *I have a whole huge list of kitchen mishaps that have contributed to this actual fear, including second degree burns from ramen noodles, a minor explosion trying to light a pilot light- when my hands were still in the stove, and a stove with electric burners that ended up having an exposed element and dramatically exploding our first day in a new apt when a pot boiled over. Plus, I just HATE cooking.